Saturday night saw the event traverse the longest competitive stage through the Kimberley before a short transport into Kununurra. The stage would present no problems for the leading three Commodores but behind them there was dust, frustration, time loss and of course, the tragedy of a multiple fatality. Upon daylight was a mostly liesurely 'Sunday drive' through to Darwin. The Gibb River Road is now a popular tourist route but few would consider tackling it in a normal road car, even now that it has been somewhat upgraded but still mostly unsealed. Tourists usually take a week to traverse its length, not 6 hours! In 1979 this 516 km stage was fast, mostly rough and rocky, very undulating with many blind crests, and certainly very dusty. The numerous creek crossings were sometimes sharp and potentially car breaking. Some crossings had water and the Pentecost River in particular was 300 metres of water interspersed with rock outcrops and sandbars. For all the leaders the stage was completed in darkness, which was a shame given the strikingly beautiful scenery. Brock would have started the stage about 10 pm with Mehta and Ferguson nicely spaced behind with good gaps of 10 to 15 minutes. These gaps were crucial to a good run and times on the stage ultimately reflected how much dust they encountered. Only the three Commodores would lose no time, achieving the 100 km/h average speed. Next after the Commodores would have been Dunkerton, a good 40 minutes behind Ferguson and therefore with a dust free run. Then came Barth’s Porsche and Portman, the interloping Subaru of Koeski then Cowan, an interloping VW (probably Moore who had booked in over 2 hours early at Napier Downs), the interloping Colless and then Nalder, all with gaps of 5 to 10 minutes. The first 8 leaders were spread over more than 2 hours with at least 3 interlopers that would cause problems for Cowan and Nalder. Some way behind them was Gil Davis, Edgar Herrmann and Greg Carr. 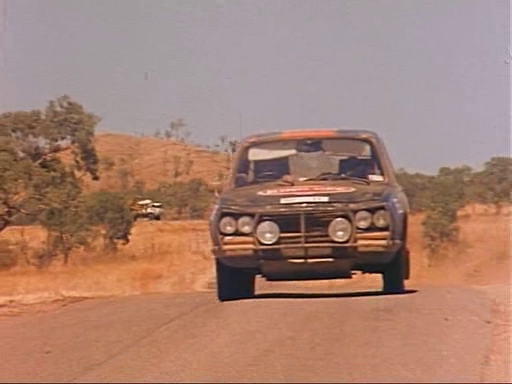 Denis Baker’s P76, having skipped earlier stages, was scheduled to go out in front of Nalder but agreed to let Nalder go first. It remains a mystery why the organisers could not hold those few cars so that those who had done the entire course could at least only have each other’s dust to contend with. As it was, Cowan sat behind the Subaru for hundreds of kilometres unable to pass. 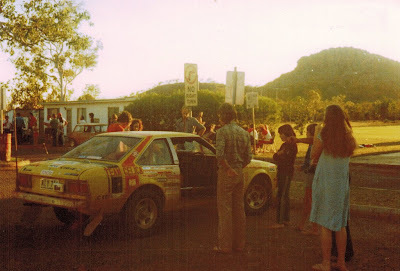 Nalder got past the VW when they stopped after a creek with some damage while Dave Colless stopped and allowed Nalder through, but then with Richards driving, the Celica followed Cowan and the Subaru for about a hundred kilometres. Eventually both Cowan and Nalder passed the Subaru, but not without a lot of dangerous antics. Dunkerton’s fuel pump failed and he had to jerry-rig a gravity feed system, then they blew two tyres and broke a tie rod and had to limp the last 20 km to control, eventually losing more than an hour. Portman had broken an oil line and had to effect makeshift repairs, losing 27. Davis went off the road in dust and was lucky to escape with minimal damage, but was almost an hour late. Further back still, Rowney and Carr both must have passed a number of cars but still had plenty of dust and dropped about half an hour each. It was during this section that the double fatality occurred when the Peugeot 504 of Norm Saville, Peter Harris and John Fyvie rolled into a creek, reportedly in dust and driving into the rising sun. Harris and Fyvie were killed. There was something of a veil of silence around this incident, despite it being given a fair bit of coverage at the time. It eventually emerged that they had been carrying a spare differential in the car, presumably not well restrained. Such a tragic outcome was certainly something that should never have occured in a well prepared rally car. Finlay/Sullivan/McLeod (Commodore) were first on the scene and administered first aid to Saville, obviously losing considerable time themselves, having had a great run since Perth and not having missed any controls. They then left Goldsborough/Flanagan/Ground (Commodore) as they went to notify authorities. Goldsborough, although having missed controls, took a maximum 4 hour penalty on the stage but later received the organisers' Sportsmanship Award. * Finlay and Goldsborough assisted at the scene of the fatal accident. Apparently that Saturday night Kununurra held its annual Mardi Gras. The first car would have pulled into town just before 4 am after the transport in from the end of the Gibb River Road. Although the leaders were over an hour late into Kununurra, a scheduled hold ensured that they were back on time leaving Kununurra. Crews also changed to CST, winding their clocks forward 1.5 hours. A few crews dropped time into Kununurra, most notably Dunkerton who was grappling with the gravity feed fuel system and was 3 minutes late. Others late included Lockhart (6 minutes), Beveridge (9 minutes), Hilton (10 minutes) and O'Shanesy (over an hour). This was back when NT didn't have speed limits so the organisers had set an average just over 100 km/h for the long transport stage from Kununurra to Darwin. Much of the road from Kununurra to Katherine was single track bitumen. Failure to go completely off the road and stop when faced with an oncoming road train was likely to lead to problems, probably multiple punctures on the rough edges. The other hazard was wandering cattle, of which there were many. The scenery is striking - rocky escarpments, lush river gorges and flat savannah plains dotted with huge ant hills. Crews needed to refuel in Katherine and further north between Pine Creek and Adelaide River the highway is somewhat twisty and slower. No-one had a whole lot of spare time once they got to Darwin. Plenty of crews lost time on the transport. All the leaders were on time except Portman who was over an hour late after dealing with the broken oil line. Upon arrival in Darwin crews were issued with a bulletin about the fatal accident and that the scheduled overnight stop was going to be extended for 2 hours with the first car out of impound on Monday morning at 5.00 am. At least the leading crews got a rest of up to 12 hours, but surely much less for the late runners. Wes drove the first half of this stage as I slept soundly in the back, occasionally awoken by rough dips and creeks, some with water. The road was obviously extremely quick. We passed the VW stopped after a bad creek crossing. I woke up properly at about 190 km and Geoff told me we were right on schedule but we expected the road to deteriorate. At 203 km there was the only gate in the stage and it was closed. Wes was very tired and we approached it very quickly in a bit of dust. He slowed OK but eased off at the last moment and hit the gate very gently, pushing it open! It seemed like a good time to change drivers so I grabbed a quick drink and jumped into the driver’s seat. Wes was asleep almost instantly in the back. The road continued to be fast, with some sandy stretches, lots of dips and creeks, but we made good time to the Kalumburu turnoff at 277 km despite getting patches of dust. At the turnoff we passed Dave Colless who was stopped. From here on the road was somewhat more twisty through lots of undulating country, but the dust kept getting worse and we were obviously catching someone. I tried hard to penetrate the dust but couldn’t get any closer (it turned out to be Cowan being held up by the Suburu). After 10-15 km of hairy antics I decided to back off a bit and we cruised along hanging back from the dust for a while. Then the dust seemed to clear (Cowan had passed the Suburu) so I started to push hard again. I was making more progress through the dust now but was very tired and it was getting dangerous. At one point I could see the headlights of the car ahead of us hitting the road about 500 metres ahead as we came over a crest. This enticed me to try harder and I headed into the dust against all common sense. We could just see his tail lights as the road kinked right into a creek and I followed being unable to see much but he was so slow in the creek that we almost collected him (it was the Suburu). He came out on his bumper and he soon pulled over. We had a pretty clear run after that with Cowan pulling away a little. I was very fatigued for the later part of this stage but was determined to get to the end. I was almost dreaming, driving on reflexes. The Pentecost River crossing perhaps woke me a bit – lots of water and rocks. The remaining 56 km was then pretty good but with lots of crests. We passed Dunkerton about 10 km from the end stoped with a fuel problem. 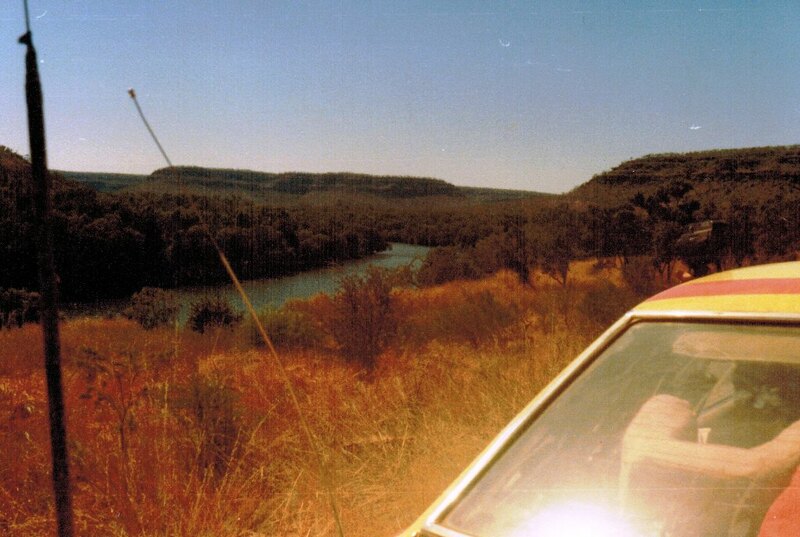 Geoff drove into Kununurra where we arrived just after dawn. The Commodores, Portman and Barth had departed but Cowan was still there and Dunkerton arrived after about 15 minutes so we could all compare notes. Shepherd was still there and we chatted to Tuckey as well. We were held for 30 minutes and I recall Watson arrived just as we were departing. We refuelled and Geoff continued to drive. 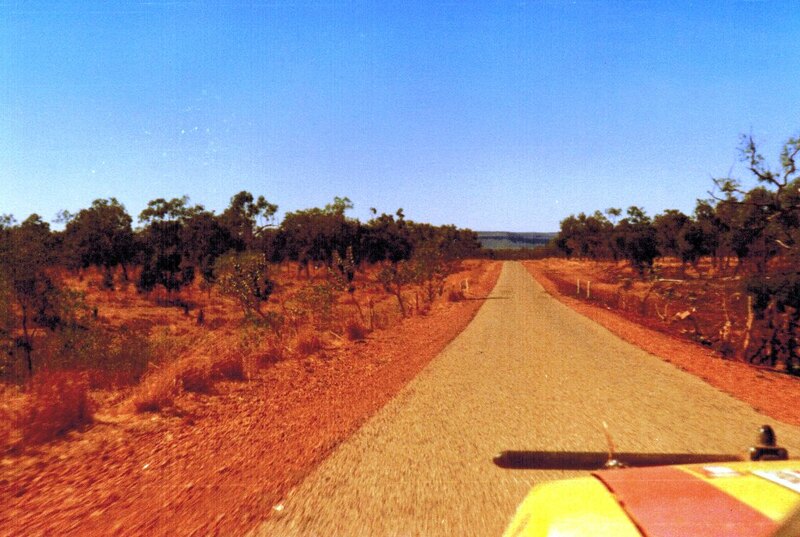 It was a long transport to Darwin that would take all day and we changed drivers several times. The scenery is striking but the road is often single track bitumen with jagged edges and the hazards of oncoming road trains and wandering cattle. About 50km short of Katherine we smelled oil and stopped. The oil filler cap had come loose and was missing! We stuffed a rag in, checked the oil level and headed off. A steam clean of the engine bay would be needed in Darwin! By Katherine we were slightly behind schedule and had to push on the run up to Darwin, which was especially interesting on the section from Pine Creek to Adelaide River which is quite twisty. We made Darwin Parc Ferme on time but without a helluva lots of time to spare. It was 5.40 pm and we were soon in our room at the Travelodge ordering room service dinners. Like all competitors, we received the bulletin about the fatality and the extra 2 hours for the layover. We were so tired that the impact of the news didn’t really sink in. And if we were tired, our service crew were even more so – they didn’t even arrive in Darwin until after 10 o’clock at night!